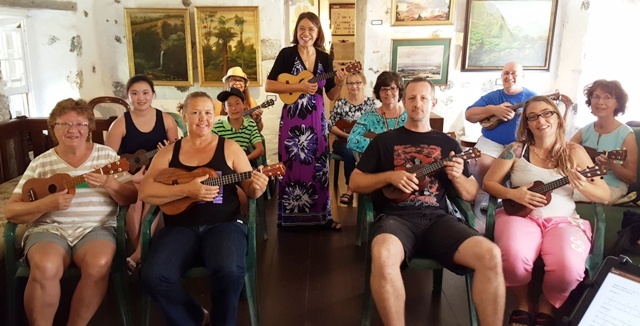 Eleven people came to my 40th ‘Ukulele Strumming Workshop on February 18, 2017 at Hale Ho’ike’ike at the Bailey House in Wailuku. This brings the total to 515 people I have taught since my 2-hour workshops began on July 14, 2012. Participants came from Utah, Oahu, and Maui. My goal for the workshops is to introduce people to the Ukulele Mele Way so they will want to learn more. The youngest participants were a teenage brother and sister from Utah who did great. The next workshop is scheduled for March 18, 2017. Register now and then pay the $10 non-member or $5 museum member fee at the door-of the museum. This will be the last workshop until October 2017. Can’t make it to Maui? Schedule private webcam lessons from the comfort of your home while I teach you from mine. Visit my online Fan Club and listen to 98 audio recordings of songs you can learn to play the Ukulele Mele Way with private lessons. Another option is to subscribe to online lessons for self-study or purchase Single Song Lessons (choose from 40 songs) to download to your digital device. There are many ways to have fun learning the Ukulele Mele Way.